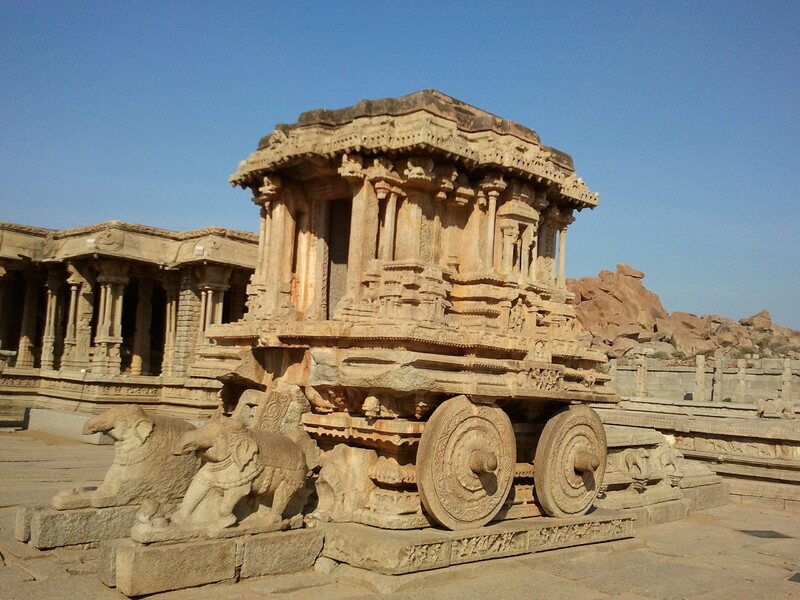 I have been in Bangalore for the past 4 years, and ever since I came here, I have been wanting to go to Hampi. Finally, the plan materialized and we decided to go on a week-long vacation there in January. I had read a lot about this UNESCO World Heritage site, and also heard about its beauty and splendor from friends. I went with a lot of expectations and my expectations were not let down one bit. You have to see Hampi to believe it. The site is on the south bank of the river Tungabhadra, and it is said that Hampi got its name from this river, which in olden days was called Pampa, and was worshipped as a river goddess. While settlements in Hampi and areas surrounding it can be dated back to the early part of the first millennium CE, the city actually reached the zenith of its political power as the capital of the powerful Vijayanagara Empire between 1336 and 1565 CE. The empire got its name from the capital city of Vijayanagara, meaning ‘City of Victory’, which in those days included the present day Hampi and areas around it. Contemporary chroniclers from Persia, Portugal, Italy, and Russia visited the empire during this period and left glowing accounts of the city, which was unparalleled in India and probably the world at the time. This once magnificent city, pride of the Vijayanagara kings, was ransacked in 1565 CE by the Deccan Sultans, who had formed a unique alliance against Vijayanagara. After defeating the Vijayanagara army at Talikota, some 90 kilometres away from the capital, the marauding Sultanate armies entered the city, plundered and pillaged it for 6 months, and then abandoned it. So thorough was the process of destruction that very few buildings were left intact. What remains at Hampi today are only the ruins of that great, magnificent city. Anyway, we will come to the sad part of the story later. For now, let’s focus on the foundation and growth of this great empire. The terrain is, however, one of the most ancient and stable surfaces to be found anywhere on earth, its unique rocky appearance caused not by earthquake and upheaval, but by some three thousand million years of erosion, first underground and then, when uplifted, by exposure to sun, wind and rain. I had studied about the Shore Temple at M ahabalipuram in school and I remember being fascinated by the description in the book. I pictured it in my head as a majestic structure in black granite against the backdrop of the sea, with the waves lapping against the temple walls. How poetically beautiful! 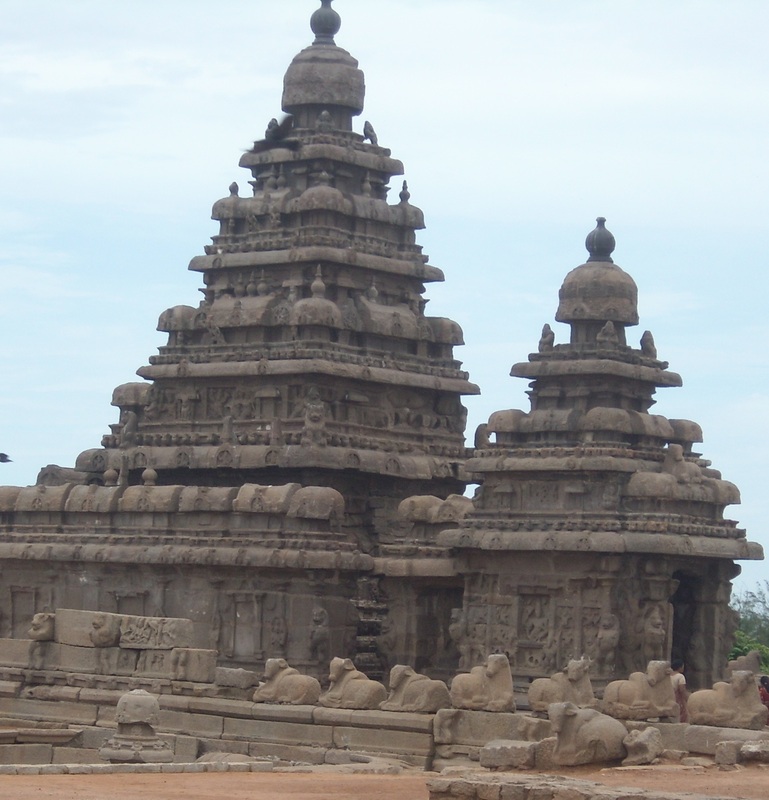 Some time back, I had the opportunity to travel to Mahabalipuram and see the Shore Temple. My wife and I had gone to Pondicherry for a vacation and we learnt that Mahabalipuram was only 100 kilometres away. So, one morning we drove from Pondicherry to Mahabalipuram, covering the stretch in about one and a half hours. As I entered into Mahabalipuram, I realized that the place is no bigger than a small hamlet. It looked as if the place is frozen in time. My guess is, it wouldn’t have looked very different 300-400 years ago. We asked for directions to the Shore Temple and parked our car in the KSTDC parking lot. We met a guide called David who promised us to show not only the Shore Temple, but also all the other monuments in Mahabalipuram. He was a nice guy and we soon started chatting. He said he was born a Hindu but got converted to Christianity to marry his sweetheart. Heartwarming story, isn’t it? Anyway, I digress. Let’s return to the Shore Temple.